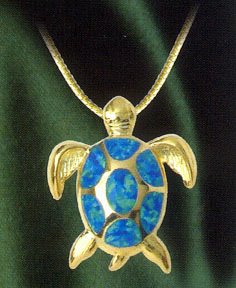 The gorgeous Sea Turtle Pendant is made of Created Opal, CZ Tanzanite and 14kt Gold over Sterling Silver. The pendant has a loop to place the pendant charm on any chain. A beautiful piece of artwork that will be enjoyed for a lifetime. Makes a great gift! Velvet pouch and gift box included! The pendant has a loop to place the pendant charm on any chain.